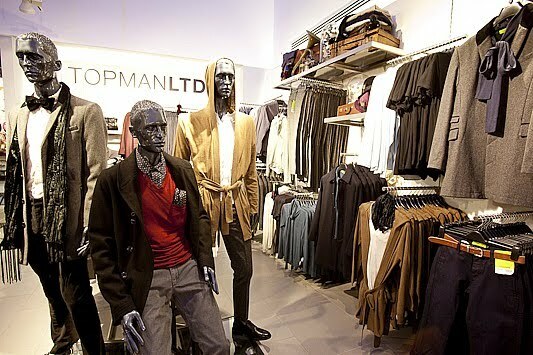 Topman: The Menswear Shopping Emporium? Compared to its bigger and better sister, Topshop, Topman has always lacked a certain charisma, yet a revamped floor design may finally be taking highstreet menswear to new levels. In fact it quite literally is, as last night saw the new 23,000 square foot top level space revealed. With a whole official day dedicated to menswear this year at LFW, it’s clearly the week of the man. Fittingly then that Topman have decided to revamp their tired and rather bleak floor space into a brand new swanky hub of stylish fixtures and concession overloads! By this I mean there is an Eat Café, an Office ‘Trainer Boutique’, Rough Trade listening posts and recommended album chart (the first of its kind) and a UK Sharps Barber to keep all those beards and ‘taches under control! Amidst these quirky features the space will house Topman’s existing ranges, designer collaborations which include TM Design, Lens, the new LTD range and also mainline collections from MAN designers James Long and Christopher Shannon. Oh and squeezing in just another new feature, the ‘Red Area’ will become a trendy new space for collections to hold base for a while and get customers familiar with the trend, picking up tips along the way on how to work and style it. Now there’s a shop floor worthy of a visit.